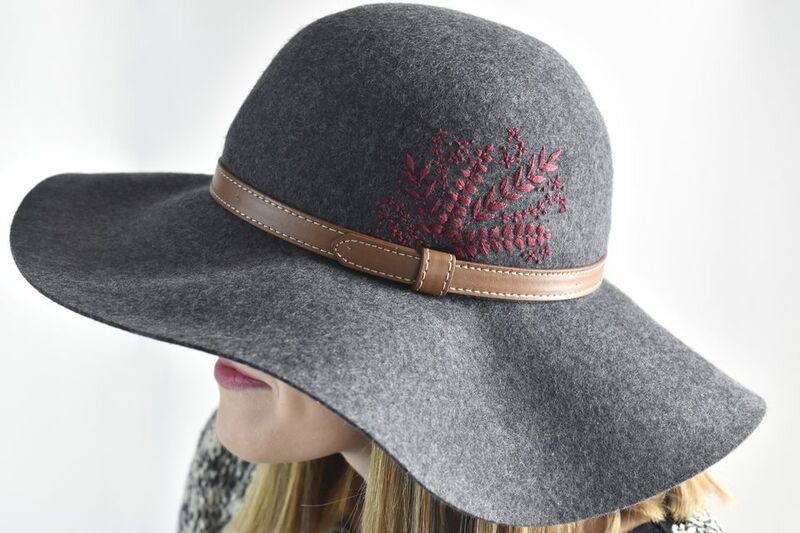 A floppy felt hat is a great way to show your sense of style while protecting yourself from the sun, and this DIY embroidered version is sure to draw attention. Working with a free foliage spray embroidery pattern, you'll soon have a chic cold weather accessory. The stitching is simple and sophisticated. Use a single color for all the embroidery for a subtle look or be bold and work the design with your favorite shades of green, plus a few brights for colorful flowers and leaves. Grab a vintage or new felt hat and start stitching! A felt hat: Working with 100% wool felt is the best, but even inexpensive felt hats work for this. Embroidery floss: Choose a color that coordinates with the hat and that you like for the entire embroidery design. Needle: Use a sharp embroidery needle that isn't too large. Thicker needles are more difficult to pull through the felt. Download the Foliage Spray embroidery pattern. The downloadable JPG includes the pattern facing two directions so you can choose which side of the hat you want the foliage to be on. Resize the pattern so it is a good proportion for your hat and then print it out. You may need to do this several times to find the best size. Follow the stitch guide above when you work the design, using three strands of embroidery floss throughout. Use back stitch for all of the stems. Work the leaves using satin stitch, with the stitches extending from the stem out to the tip of the leaves. Use detached chain stitch for the flowers and tiny looped stems. Work all of the dots with french knots (or colonial knots if you prefer). Use the tracing paper method to mark the pattern on the hat. Trace the entire design onto the tracing paper. Use regular thread or a single strand of embroidery floss to baste the pattern to the hat. Where the hat curves, do your best to keep the pattern as flat on the hat as possible. Embroider the design through the hat and the tracing paper, referring to the stitch guide or choosing the stitches you like best. If your hat has a band like the one above, pull it away from the hat as you stitch. Do the same with any bands inside the hat so you avoid stitching through them. The process of passing through the felt and paper can wear down the embroidery floss and cause pilling. To help prevent this, use a thread protectant like beeswax or Thread Heaven. When stitching through tracing paper and onto felt, the paper sometimes tears when you pull the stitches taut. Sometimes it's also tricky to see exactly where your stitch should start or end. That's okay! The embroidery may not come out perfect, but as long as you follow the pattern as best as you can, it will still come out beautifully. After you finish stitching, remove the basting stitches. Then, begin carefully tearing away the tracing paper. Avoid tugging or ripping the paper too quickly because it may disrupt your stitches. The paper bits under the satin stitching are the trickiest to remove. It's tempting to leave them there, but they inevitably show. Use your needle to lift the paper through the stitches, then pull it out with tweezers. Check that all of the stitching is smooth and then trim away any fuzzy threads from the felt. If needed, iron the brim of the hat. Your hat is finished and ready to wear! If you'd like to add some extra sparkle, you can stitch a few beads or sequins in amongst the foliage. The hat shown above came with a faux-leather band, but if yours didn't, try adding a thin ribbon around the hat at the base of your embroidery. Wear your hat with pride, showing off your style and stitching skills!